Whether painting or doing some remodeling or construction a canvas drop cloth is a must have. These are the only solution for protection and durability. These heavy duty, reliable cloths can be useful in so many different applications. Originally, this product was made from canvas. Tarpaulin or tarps, often refers to that material that is used for covering many things, once was prominent for use on the big ships of olden days. Often they were used on the upper deck to protect barrels of food, rations and other similar items as a protective means to shelter them from storms and excessive water. Modern tarps are made of cotton but is quite different from the cotton that is used in dresses, for example, because of the way it is made. Along with the reinforcing top stitching they have eyelets every 2 feet along the edge. This is great for typing them down over something needing protection. They also can be laid down and draped over things for applications such as painting. Great for protecting furniture, floors, and even bushes or shrubbery. There is two types of canvas available on the market today, which are duck and plain. This material is also coated with oil and that is how is becomes water resistant. This material is perfect for outdoor use or for protecting something from the harsh weather. This helps to make it more durable and long lasting. The duck material is also great for painting projects. 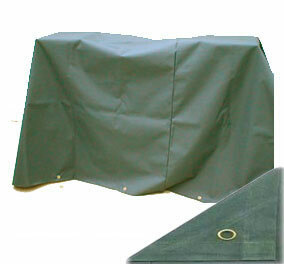 The white canvas drop cloth tarps are 100% industrial grade cotton which offers great shade and protection from the sun. They are strong and heavy duty to withstand the elements and normally come in either a white or off white color. They are also washable and reusable so this makes for the perfect solution for many projects in years to come. While somewhat heavy and possibly difficult to move from project to project using a canvas drop cloth will not only give you the protection you need but also the confidence to attempt projects you thought you would never do.